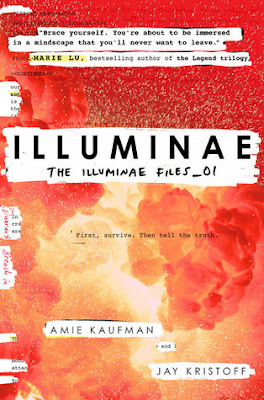 Describe Illuminae in just 5 words! Explosive, romantic, suspenseful, thrilling… different. Who's idea was it to format the book in such a unique way and why? The decision around formatting was definitely a team effort. We started out with the idea of an email book, and things quickly spiralled from there! We asked ourselves why our main characters would be emailing, and decided they were separated because they were on two different spaceships—and then we started asking ourselves whether we could use documents that weren’t emails to tell parts of the story that they wouldn’t discuss. From there, we added in IMs, schematics, military documents, comic strips, movie posters, security footage, you name it. The final step came when AIDAN, the ship’s artificial intelligence, became a narrator. AIDAN records what happens in the book very differently—words float in zero gravity, and fly about the page during fights. Ultimately, we wanted to play with the idea of what a book could be, and challenge a lot of what we’d grown up thinking. We wanted the format to be a part of the story, melding together with the words so that each contributed to what the reader understood. Did you have any disagreements while co-writing? If yes, what were they about? We never disagreed while writing, because we both had exactly the same goal, which was to write the best book possible—and that meant we were never bothered when the other one asked questions, suggested a different option, or offered critique. Instead, if we had different ideas, we’d sit down and brainstorm until we got something we both loved, knowing the book was stronger for having two brains on the job. 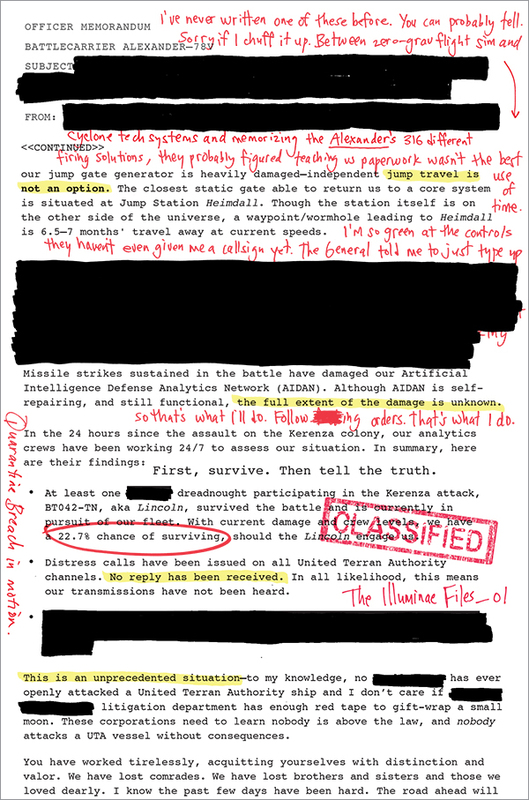 Which character in Illuminae was your favorite to WRITE and why? For Amie it was Kady, because soooo much snark and sass. It was too much fun. And Kady’s a very real character, full of uncertainties and failings, even as she’s pulling off some thrilling heroics. That combination was fantastic to write. For Jay it was AIDAN, because the deeper you go into the artificial intelligence’s way of thinking, the twistier things become. Throughout the book, AIDAN wrestles with some deeply philosophical questions, and the chance to explore those—and utterly confuse readers about whether they were supposed to hate AIDAN or cheer for it or do something else entirely—was incredibly rewarding. Tell us 5 random things about yourself that we'd never find on Google. Amie used to work as a sailing instructor. Jay used to play in a band. Amie and Jay both have canine sidekicks, who love to try and climb into their laps and block their laptops as they work. They chat via IM during the day as they write, and there’s always an afternoon break when the hounds need walking. 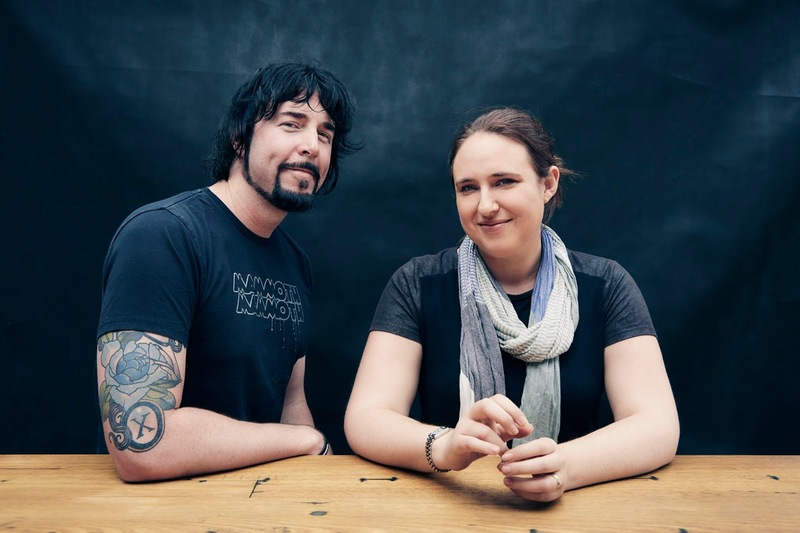 Jay and Amie were born on opposite sides of Australia, 3,440 kilometres (2,137 miles) apart, but they now live just 30km (18 miles) apart. They still manage to run late every time they try and get together to write. Illuminae is an awesome, unique book and so are the authors! If you haven't read it yet, what are you waiting for? Grab a copy from your favorite bookseller today!